It possibly would come as no surprise that my childhood favourite LEGO theme was Adventurers. Some of my fondest playtime memories are of sprawling bedroom wide Adventurer Expeditions that ranged from the archeologically accurate dig site to a cartoon caper of chasing down the baddies while being chased by the Mummy or jungle tribesmen. The focal figures (literally!) were always Johnny Thunder and Pippin Reed. 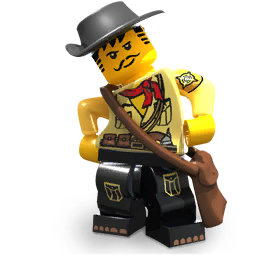 Johnny Thunder was part of the Theme Logo, he has appeared in eight LEGO video games. This chap was cornerstone enough to feature in The LEGO Movie and have a re-issue in the Super Secret Dropship set. So why don’t we get to know about our be-hatted hero. Back in the long ago days of the 90s there were not quite so many linked multi-media goodies for LEGO themes as there are these days. There were some small features in the LEGO Club magazine, the advert-comics that featured in kids magazines and sometimes the odd TV advertisement were all we really had. These might give you a few titbits to broaden the world presented on any bonus pages in the instruction manual or the little sheet that presented the other avaliable sets. Of course, many times you only learned the character names by purchasing the set they came in. With each language and market location there could be differences between the promotional material because no one had any communication or a single platform to access. This led to curiosities like multiple identities for the same character. Johnny also went by Sam Grant or Joe Freeman in other parts of the world. I was introduced to Sam Grant from the back of a cereal box promoting their giveaway (only six tokens and the p&p!) that included our intrepid hero and his desert car the Scorpion Tracker. Despite alll the names he still had his moustache, sideburns and the dimpled chin of a hero! Johnny Thunder and the Adventurers theme appeared in 1998 to 2000 with a revival in 2003. In this time the Adventurers, heroes and villains, travelled to many lands. The tomb filled deserts of Egypt where an undead Pharaoh lurched. Up the Amazon river with jewel thieves and lost tribes guarded gold. To a mystery island that time forgot with dinosaurs to protect from poachers and finally the Orient on the trail of Marco Polo's treasures. 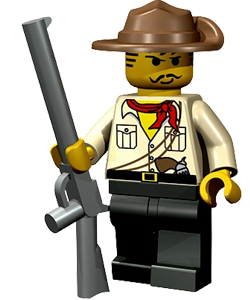 Johnny Thunder also gained his first acting credits in LEGO Studios, tumbling through a booby-trapped tomb and being chased by less friendly dinosaurs. As Johnny Thunder had plenty of adventures in a number of places quite sensibly he had a well stocked wardrobe to go with his trademark hat. While the well known tan shirt served well in the desert, the jungle and tracking dinosaurs there were varients for each of the locales of the Orient he ventured to. Classic, India and Tibet outfits. The tan shirt followed the same outfit archetype of the serial-film heroes Indiana Jones was drawn from and the later variations fitted in to the different locations visited in Orient Expidition. The reissue figure for The LEGO Movie follows the classic look with sharper printing, details on the back and the new colours LEGO brought in after Adventurers were no longer in production. This figure is a really nice inclusion on the part of both the Movie team and TLG, a little 'classic' nod to all of us AFOLs and something for my peer group to notice even if they aren't super LEGO fans. Just like any other superstar, Johnny Thunder appeared in many media ventures, from a simple 'easter egg' to a feature character in games and of course The LEGO Movie. A number of LEGO video games were released during the Adventurer's heyday and plenty of them featured the characters and theme locations to play through. The LEGOLAND game had Adventure Land attractions and features to unlock as you progressed with cutscenes too. The next game to feature Johnny was LEGO Racers as an opponent to race with a number of circuits based on the Adventurers theme. In LEGO Island 2 Johnny and co help Pepper Roni in his mission to collect Constructopedia pages on Adventure Island. In Racers 2 Johnny was once again an opponent in races and also an NPC interaction for mini-games and returned again as an NPC racer in LEGO Stunt Rally. In LEGO Soccer you had to face off against an Adventurer Expidition team made up of characters from the theme and once defeated Johnny became an optional player for your own soccer team. This was a time in LEGO history where a lot of video games were made so of course Johnny would feature often. He was a major LEGO character at the time after all! Once Adventurers ended and slowly left recent and target market memory and game development moved out-of-house to developers like Travellers Tales, Johnny Thunder and co didn't feature. However with the launch of LEGO Universe he was back as a member of the Venture League. While the character was intended to be the same Johnny Thunder from the Adventurer theme, he underwent many design tweaks, even appearing in a rather different guise during Beta Testing. Fan feedback (of which I was most certainly a part!) managed to return him to a more classic look as seen above, the only minor changes in accessories and 'printing'. 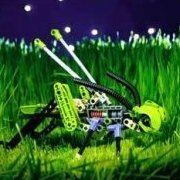 In LEGO Universe the player had to complete missions for Johnny in order to receive Venture League approval and open that faction as a choice to join. Of course, now we come to his latest major role. A Master Builder in The LEGO Movie! First spotted early on in a call-back to Indiana Jones, he rescues his hat just before slipping through the perimeter walls to escape the forces of Lord Business. He is present for Emmet's, ah, stirring speech and is seen fleeing the golf ball once again reminscent of Indy. Later, as the citizens of Bricksburg fight the micromanagers Johnny is noticeable riding a horse that is riding a bigger horse. Thus we can conclude that I really am a bit weird and look out for a minor character when watching the movie! I'd love to post some clips but there aren't any to be found online that feature Johnny but if you missed him before we all know that no one needs an excuse to watch the film again! 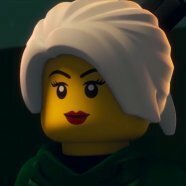 So, Johnny Thunder was and is a pretty cool character and while his moment in the sun might be over and Adventurers was continued in a new guise we can surely look forward to his next heir in whatever form he or she takes. Adventurers was one of my favorite themes, and it's great to have something like this to show how far it has come--at least in regards to Johnny Thunder! 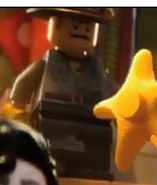 I was very excited and happy to see him appear in the Lego movie (I think he also appears in the scene that shows the police hunting Master Builders, where he is sneaking around a billboard and is spotted by a searchlight--followed by the hat scene, by the way), and I really hope he gets a larger more important appearance in the next one. It would be hilarious to see Indiana Jones next to Johnny Thunder on the big screen! So need to start building Adventurers mocs! What a nice tribute to one of Lego greatest (super)-heroes Peppermint-M. I was in my dark ages when Johnny and his friends travelled the world, but once I discovered Bricklink, one of my first "projects" was building a collection of adventurers minifigs, (and some sets). Maybe the fact that seeing the IJ sets got me out of my dark ages had something to do with that? Thank you, Peppermint-M, for bringing Johnny back into the spotlight! 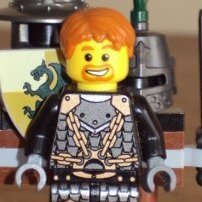 I had a couple Adventurers sets back in 2000 (Dino Island) and 2003 (Orient Expedition) and I was very pleased to see him in the LEGO Movie "Super Secret Police Dropship" set. My question is this: Now that they have his mold for his hat again, do you think there is a possibility for a revival? The last Adventurers-like theme was the single Monster Fighters wave back in late 2012.... once the Haunted House goes away later this year, do you think it is possible for Thunder to return? 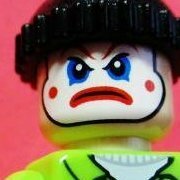 Nice article, say, how about making a series of articles about iconic minifigs? I already have some ideas: Captain Redbeard and his crew, Ann Droid from Exploriens and her brother Andy from Spyrius, Classic spacemen including Benny, Basil the Batlord, Knights Kingdom I and II cast, Blacktron, Majisto, the first Lego wizard, Rock Raiders, etc. Well, I am glad people like my little article! Johnny Thunder was always the best in my opinion so of course I wanted to shout about him. I was allowed to watch The Last Crusade and have had a lifelong love of history (A 5 year old who wanted to be an archeologist!) and Adventurers was of course the theme for me. The Indiana Jones sets provided me some excellent parts to play with. As for the refreshed hat, I would love to see it used in other sets but any sort of Adventurer revival set in the subtheme would be really cool. Though it will need to slot in with all the Chima and Ninjas and Agents that TLG are doing. Hmm, a series on all of the minifigs might be cool! I'll give it a think. I used to have Adventurers as a kid. This was a very interesting article, never knew one mini figure could have so much going on. I think the regional variation on names is especially interesting. I wonder if there are any non-AFOLs out there who still know him by one of those names. Also never knew of all those video games. He looks weird in some of them. A worthy article on a deserving character. I first came across him back in 98 in a commercial extolling "the bravery of Sam Grant" (shame I cant find this commercial anywhere online), and it took me a while to get used to "Johnny Thunder". The Orient Expedition website confirmed that. In addition, in all of the previous Adventurers Flash games released by LEGO which remained on the site until it was finally shut down when LEGO decided to wipe their servers, he has a very distinct accent and uses words that are stereotypically Aussie. Johnny being Australian goes back to the original US story synopses from 1998. Although we don't have access to the synopses themselves (they were used for partners creating promotional materials only), the LEGO Racers developers would have had access to them, and they clearly depicted Johnny as Australian through both his voice and the musical sting that plays in his intro video. Now I was going to say about him being Aussie, but nice article 'Peppermint' I enjoyed the read......I wonder if he'll make a return in future Lego movies that we see on the big screen ? The first paragraph pretty much sums up my own childhood. Seeing him in The Lego Movie proves that Lego knows how popular and beloved Johnny Thunder is among fans, that gives me hope for an Adventurers return. Can't wait for his next adventure! Thanks for the great overview. My first set was a Johnny Thunder set (Bi-Wing Baron), and I remember the theme fondly! Great tribute to Johnny Thunder! 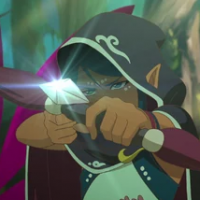 I also hope for a return of adventurers. What a fascinating read! I've always wanted to know more about Johnny Thunder. It's a real shame that Johnny Thunder wasn't around when Lego themes had their own animated series like Chima and Ninjago, which in my opinion would have been far more interesting. Here's hoping for a comeback with a large cast of supporting characters, good, bad and all those in between. A decent opportunity for Lego to showcase all the architectural styles the world has to offer, as well as animals and new accessories. I did hear of Johnny Thunder being Australian, but I was unsure how global this was. He features quite heavily in LEGOLand parks and for quite a long while in Windsor the harbour show was Johnny Thunder and the x-y-z (insert artifact colour + animal/creature). A new Adventure theme would be great but I'm not demanding more Johnny Thunder or Jake Raines, new characters are welcome because them come with new prints! Well, when you have waited a significant amount of time for a new adventure, a theme with vintage vehicles, dusty deserts and treasures to uncover is just what you want! ~Oh, another fun factoid: The 'hero' character of Dino, featured in the big box set is named as Josh Thunder, a descendant of of Johnny! I love Adventurers theme and Johnny Thunder and that commercial was funny. Bring Johnny Thunder back!! For some reason, every time I hear Johnny Thunder, I think of Erron Black from Mortal Kombat. I mistook the two one time. It would be fitting to mention his appearance on a poster in the 75900 Scooby-Doo Mummy Museum Mystery set. Yes! The one and only Scooby Set I want for myself.